Offering Discounted Child Care for Your Employees as an Added Benefit! 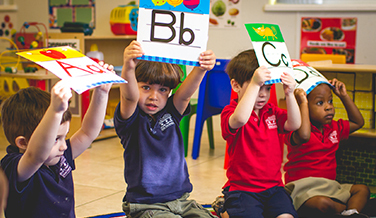 With six convenient locations in the Palm Beach County, Florida area, we are super excited about offering the following corporate discounted benefits for childcare as an added incentive for your employees. Free Live Webcam Services for your employees. Parents can view their children at any time, from anywhere, in the world while they are at work. This offers your employees peace of mind. 10% tuition discount for your employees (Employees must pay using our Auto Monthly or Bi-Weekly Payment option in order to get this discount). Priority enrollment – If we have the space available, your employees get priority. Free hot meals (breakfast, lunch & snack) prepared daily on site for their children. Home Away From Home Learning Centers Does all the Work for You. Provide your employees’ children with the highest quality child care experience. It’s our mission to make your employees happy. We offer a safe and secure environment where children are constantly engaged in learning, playing, and growing. We offer quality childcare for infants as young as 6 weeks to 5 years old. HAFH also offers aftercare pickup from local schools within the area & Summer Camp for children up to 10 years old. HAFH also offers extended hours of care for an additional price. (Not all locations offer extended hours). Please visit our website www.homeawayfromhomechildcare.com to learn more about HAFH and what we can do for your employees. Please do not hesitate to contact us as soon as possible to see how we can partner together and make your employees happier than ever about the above-added childcare service of benefits.